Both rooms have two circular coffee tables, each sofa has 2 pillows, and the chairs in the living rooms aren’t the same style as the sofas. Which brings me to my design tip: since some people are going to buy couch sets anyway, the least you can do is remove the pillows that come with or add to them with other decorative toss pillows. It helps in preventing the look from feeling….catalogue bought. 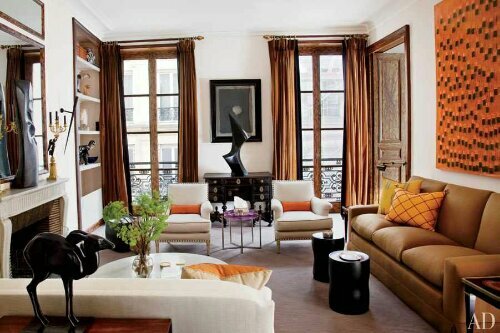 It’s always better to bring in a completely different chair or two different styled side tables than the coffee table. It makes a room feel more collected in time which is way more interesting than furniture sets/accessories. I do understand it is more cost effective to buy sets but swapping accessories, adding throws or scarves can help elevate the look. The sofas look much better with pillows that bring out the colors of the art than standard ones that may have come with them. Did you find all 3? Common Denominator is a game I came up with to see who has good attention to detail. Play more here. Todat’s cyber Monday & Shabby Apple is offering 20% off everything sitewide with code JOYFULSEASON at checkout. Sale ends 11/30/2012. Happy Shopping!